Hamatora is an anime that showed plenty of promise at first. It could have been excellent if not for one major setback: most of the anime is filler. The story is actually great when it gets down to it, but having one of the most thrilling scenes of any show this season followed up by a beach episode before returning to the actual plot just destroys the mood and momentum this show could have built up much more. That’s not the only problem, but it certainly is the biggest and most noticeable one. 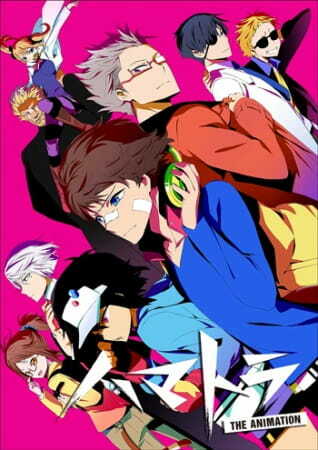 Hamatora is an anime with a similar style to things like Persona 4 or Danganronpa. It centers around a group of crime fighting, mystery solving “superhumans” called “Hamatora” and the other similar groups of people that they know. Most of the main characters have abilities called “Minimums” which allow them to use some power when they fulfill a certain requirement. The main characters and members of Hamatora are Nice and Murasaki who are both Minimum Holders. The story begins with them just doing their usual crime solving and being dirt poor because they don’t get enough jobs and a girl named Hajime spends a lot of Nice’s money on food. They soon start getting job requests that interconnect and begin to reveal a much larger scale crime. But before that all happens, the show has filler. Lots of filler. Most episodes have some small connection to the plot, but that will only be just about a minute out of an otherwise filler-filled episode. Whether it’s a beach episode, spa episode with sit-ups, or just some random event involving the minor characters, this show just has too much filler. However, the actual story is brilliant. The show overall resembles something like Psycho-Pass and Darker Than Black in the way the world and the minimum powers work and eventually crumble into chaos. The end of the show is excellent and leaves a possibility for a second season, which I would love to happen. As for the characters, they are all interesting but none develop very much or at least get enough screen time to develop. As much as I like Nice and Murasaki, they really don’t develop as much as characters in similar shows, and the show only gave small glimpses into their pasts which needed much more elaboration as they seemed very interesting. The rest of the important supporting characters are just as interesting as the main cast. They were also given some short backstories, but not enough screen-time either. Hopefully a second season will bring about more of the characters’ pasts. The art style is generally very good. The psychedelic look of when minimum holders use their powers make the action scenes very stimulating to the viewer, and all of the characters designs are great. Moral, Nice, and everyone else look cool and their designs fit their parts well. The scenery and everything else looks good as well. The soundtrack is also one of the better parts. It uses a lot of piano tracks with unique rhythms that speed up and down a lot depending on the mood. During the action scenes, rock songs are used. Nice’s signature song that plays whenever he puts his headphones on stands out in particular. The OP is also one of my favorites of this winter season.